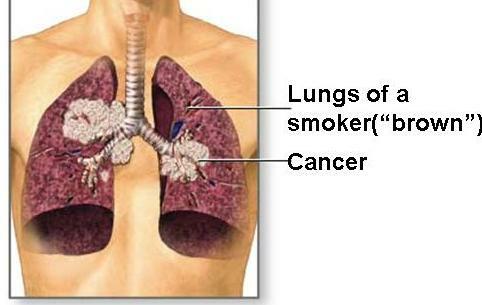 Lung cancer is a malignant tumour of the lungs. Most commonly it is bronchogenic carcinoma (about 90%). Lung cancer is the most lethal malignant tumour worldwide, causing up to 3 million deaths annually. Only one in ten patients diagnosed with this disease will survive the next five years. Although lung cancer was previously an illness that affected predominately men, the lung cancer rate for women has been increasing in the last few decades, which has been attributed to the rising ratio of female to male smokers. The incidence of lung cancer is highly correlated with smoking. The above is an illustration for the United States incidence of lung cancer.The most important risk factor for lung cancer is tobacco smoking. Treatment and prognosis depend upon the histological type of cancer and the stage (degree of spread). Possible treatment modalities include surgery, chemotherapy, and/or radiotherapy. Exposure to carcinogens, such as those present in tobacco smoke, immediately causes cumulative changes to the tissue lining the bronchi of the lungs (the bronchial mucous membrane) and more tissue gets damaged until a tumour develops. Smoking, particularly of cigarettes, is believed to be by far the main cause of lung cancer, which at least in theory makes it one of the easiest diseases to prevent In the United States, smoking is estimated to account for 87% of lung cancer cases in the US. (90% in men and 79% in women). There are hundreds of known carcinogens?such as polynuclear aromatic hydrocarbons?present in cigarette smoke. The length of time a person continues to smoke as well as the amount smoked increases the person's chances of contracting lung cancer. If a person stops smoking, these chances steadily decrease as the lung damage is repaired. Passive smoking?the inhalation of smoke from another's smoking?has recently been identified as a much larger cause of lung cancer in non-smokers than previously believed. The US Environmental Protection Agency (EPA) in 1993 concluded that about 3,000 lung cancer-related deaths a year were caused by passive smoking, however since this report was declared null and void by a federal judge in 1998, the true extent is still contested by scientists.